You are viewing an amazing set of 10 English Chippendale dining chairs hand crafted from the finest mahogany and with a delightful Gothic twist to the design. What can be said about the good old faithful Chippendale chair. It’s a design classic. The ultimate in dining accessory. Strong, sturdy, elegant, these are built to last and will serve you from here to eternity hence making them a great investment. This set has just been repolished and reupholstered so they are ready for home use right away. They come with calico seat covers – very comfortable, as well as being fresh from any previous owners smells such as pets and smoke. The finish to the mahogany is great and the chairs have a lovely veneer. The joins are solid and tight – these are solid and sturdy and comfortable to sit in, wobble free. 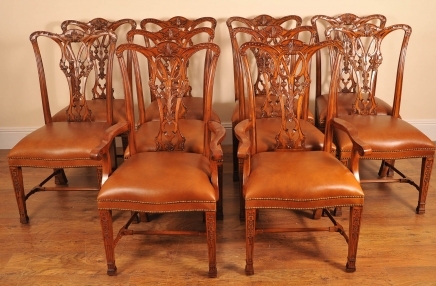 You are viewing a gorgeous set of 10 Chippendale Gothic hand carved dining chairs. 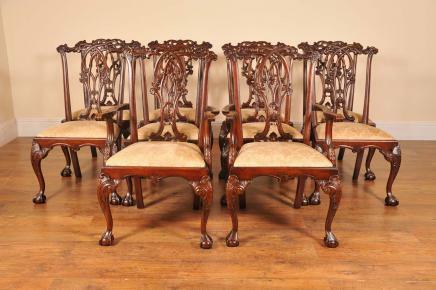 They have a lovely Gothic look with the hand carved backspat – there are further carved details on the legs and arm rests. You can only imagine the time to craft these and they are in the Chippendale manner, solid and chunky with no wobbles. These wouldn’t look out of place at the Royal Pavilion in Brighton, which contains perhaps some of the best Chippendale pieces courtesy of the Prince Regent. The chairs are solid and sturdy and come as a set with two arm chairs and six side chairs. They come with white upholstered cushioned seats with a gothic print. The seats have new fabric so are free from previous owners smells such as pets and smoke. I do hope the photos do this stunning set some justice, they’re certainly better in the flesh.